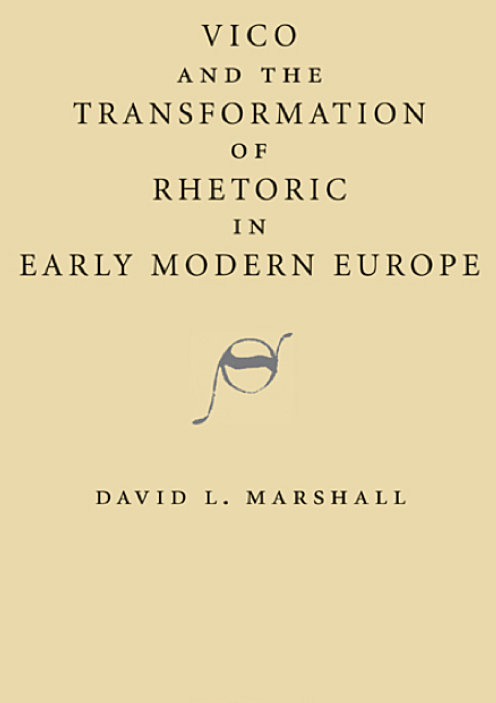 David L. Marshall is an intellectual historian of early and late modernity. He is particularly interested in the receptions and reinventions of rhetorical theory from the Renaissance to the present. For him, rhetoric lies at the intersection of a diversity of theoretical interests: aesthetic, psychological, historical, political. Initially, Marshall worked extensively on Italian iterations of rhetorical thought. His first book, Vico and the Transformation of Rhetoric in Early Modern Europe (Cambridge: Cambridge University Press, 2010), traced what he termed a “sublimation of rhetoric” in the work of the Neapolitan rhetorician, Giambattista Vico. The book argued that Vico repurposed the terms and tactics of ancient rhetoric for what would later come to be thought of as modern forms of society. In this reading, Vico becomes a key figure who reveals the senses in which rhetoric migrated into a series of other fields—history, anthropology, aesthetics, law, and others—at the dawn of modern disciplinarity. At present, he is finishing a second book on twentieth-century German intellectual initiatives, titled “The Weimar Origins of Political Theory.” In this book, he is working at the intersection of rhetorical and political thought in Germany between 1918 and 1933. His gambit is to say that, when one comes to modern German intellectual history from an early modern and rhetorical background, a slew of new connections comes into view. Discerning nineteenth-century points of origin and sketching twenty-first-century continuations, he lays out a new account of the political theory’s origins. Most recently, Marshall has been putting together a “Creativities” project as a future Senior Fellow in the Humanities Center at Pitt. This will be a series of conversations among Pitt faculty and invited guests that asks how we conceptualize and narrate creativity. Coming at the issue from a number of directions, it will examine creativity via “Ideologies” (following the concept of creativity from its origins in theology, moving through art, exploding into the biological sciences, and being imported into politics and law). It will analyze creativity via “Tropes” (tracing the metaphoric and analogical generativities that produce new configurations as well as the practices of imitation that make exemplary operations mobile—in poetry, in music, but also in the brain sciences). It will narrate creativity via “Translations” (where literary historians trace the movement of artworks geographically and linguistically, where historians think about the creative recontextualizations of older traditions, and where philosophers think about what shifts between indirect and direct speech mean for the mutability of meaning). And it will scope out creativity via “Spaces” (because the digital archive, the art studio, the library, the city, and other such collections are all combinatorial architectures). Marshall, D. L. (2011). “The Current State of Vico Scholarship,” Journal of the History of Ideas 72(1): 141-60. Marshall, D. L. (2010). “Intellectual History of the Weimar Republic—Recent Research,” Intellectual History Review 20(4): 503-17. Marshall, D. L. (2010). “Recent Research on Roman Rhetoric,” The European Legacy 15(1): 75-8. Marshall, D. L. (2009). “The Problem of Language in Early Modern Thought,” Rhetorica: A Journal of the History of Rhetoric 27(2): 225-30. Marshall, D. L. (2007). “Early Modern Rhetoric: Recent Research in German, Italian, French, and English,” Intellectual History Review 17: 75-93. Humanities Center Colloquium "Warburgian Maxims for Visual Rhetoric"